We were stopping overnight in Santa Cruz on our way up the coast to visit our daughter. We were meeting her in Sonoma. We wanted to break the drive up instead of driving straight through in one day. Santa Cruz is about half way. We thought we would go to a Thai Restaurant for dinner that our daughter had introduced us to when she was living in Santa Cruz. As we drove up to the restaurant we noticed it was closed. This was Christmas Eve. My husband started checking his smart phone for other places. If you stay on the main streets it is very well-lit. When you get onto the residential streets it is quite dark. We were pulling up to a stop light and the street was very dark with a heavy mist in the air. I noticed some bright lights down the road coming toward the intersection. I wasn’t sure what it was until it got closer as the mist caused the lights to glow. It was a train covered in beautiful Christmas lights and decorations. It looked like something from the Polar Express. It slowly came across the intersection and stopped. We were transfixed. It was so beautiful. We could see passengers inside having a good time. Santa Claus was walking down the aisle of the train giving out gifts from his large sack. Slowly the train began moving again and left the intersection behind. We sat there for a while looking after it. We did find another great Thai restaurant a while later. I did not know about the Christmas Train. I would love to take a ride on it if we are up in Santa Cruz again around Christmas. 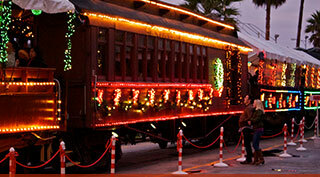 The Christmas Train is operated by Roaring Camp Railroads. The train in the video is shown crossing Pacific Avenue in Santa Cruz. This entry was posted in Blogging, California, My Life and tagged Blogging, Christmas, Christmas Train, Santa Cruz on December 9, 2014 by Deborah Drucker. Thanks Anna. It was a wondrous sight! I have seen The Polar Express but I forget parts of it except for the train and Santa Claus. I do have a copy of it and can watch it before Christmas. Yes if we hadn’t taken the route we did looking for places we might not have seen the train. Mysterious. Looks like a great way to celebrate Christmas!! So magical! Thanks for sharing! It looks like a lot of fun for families. It was so unexpected for us and that made it more magical. We did not know it existed until then. I can totally imagine the surprise! I love it! If it is the same one I’m thinking about, that train is fun all year round. But the Christmas version looks great. How fortunate you and hubby were to catch your moment with the famed Christmas Train, Deborah! I hope someday you do get to ride amid the holiday gala. Thanks Mark. It made an impression.